WASHINGTON (April 27, 2011) -- Five Soldiers were honored April 27, 2011, for their contributions to the health of the Army's all-volunteer fighting force. 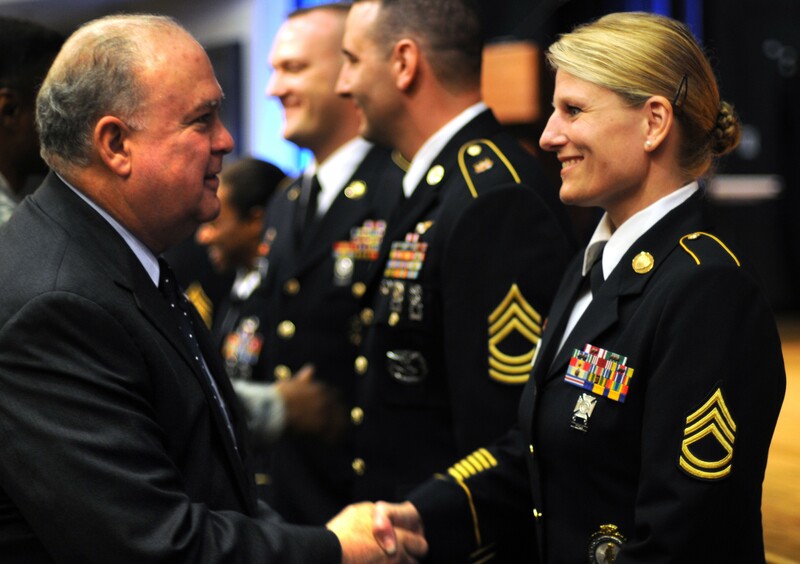 Under Secretary of the Army Joseph W. Westphal hosted the 2011 Secretary of the Army Career Counselor and Recruiter of the Year Awards at the Pentagon. Under Secretary of the Army Joseph W. Westphal greets Sgt. 1st Class Tavia Syme, Army National Guard Recruiter/Retention Noncommissioned Officer of the Year, following the 2011 Secretary of the Army Career Counselor and Recruiter of the Year Awards at the Pentagon. "We selected these Soldiers from thousands of their fellow recruiters and career counselors -- all of whom have answered a challenge and calling," Westphal said. "To get here they had to demonstrate they were the best." Westphal said that in the best of times, recruiting is difficult, but in wartime it is more so. America has been at war now for 10 years now -- the longest war ever fought with the all-volunteer force. "It is critical we retain a high-quality all-volunteer force," Westphal said. "Those we recognize today in our outstanding recruiting and retention force help make this happen every day." Westphal said Army recruiters are competing with industry for candidates who are "only the very best society has to offer," he said. "The citizens we recruit are the most sought-after people in our society. They are young, bright and dedicated. And they have options." Additionally, the group of eligible candidates for Army service is shrinking, Westphal said, due to medical, conduct or aptitude-related issues. Nevertheless, Westphal said, Army recruiters and career counselors have done a great job of bringing qualified candidates into the Army and keeping them there. "Today's Army, across all components, possesses a larger percentage of combat-proven Soldiers and leaders in its ranks than at any time in the past 30 years," Westphal said. "Our volunteer Soldiers are re-enlisting because they believe in their nation, they believe in their flag, and they believe in each other." It is Army career counselors, Westphal said, that are helping the Army keep those Soldiers in uniform, to convert their combat experience into leadership positions. "Career counselors successfully retain our Soldiers at high levels because the Army works hard to provide Soldiers with a quality of life equal to the quality of their service," Westphal said. Staff Sgt. Adrienne Campuzano, of the Baltimore Recruiting Battalion, was named the Army Recruiter of the Year. She said it is hard work that earned her the title. "This means a lot of dedication, a lot of hard work and a lot of time," she said. Recruiting is "probably the hardest thing I've done in the Army." Campuzano came from the medical career field before she took the special duty assignment as a recruiter in Baltimore, Md. She said she put in 13 Soldiers last year. The toughest part is finding those who are qualified to enlist. "It's the challenge of being fully qualified to serve in the Army today," she said. Just five years ago, it was more difficult to get bodies in the door, said Sgt. 1st Class Daniel Lucas, 1st Medical Recruiting Battalion, Fort Meade, Md. Lucas was named the Army Reserve Recruiter of the Year. He said now there's plenty that want to join up. "We are able to fill most of our foxholes," he said. But in medical recruiting, it's tougher to get those specialty jobs filled, he said. "We have to have more precision -- to analyze our markets that much more and pinpoint the individuals we're going after." Lucas' recruiting station, which recruits medical doctors and nurses, but not enlisted Soldiers, put in six last year. The Army has been challenged to get medical professionals in some specific career fields -- mental health, for instance. But Lucas said that some other types of medical professionals already have the kind of mindset needed to join the military. It's up to him and his teammates to tap into that. "Sometimes the mindset is even better on the medical side, especially with a lot of your surgeons and some of your physicians and nurses. It's really strong in the nurse corps," he said "You have people that already have that mindset of service to mankind. Now you have to talk to them and show them how they can serve that much more in the Army." Westphal thanked each of the award winners for their service "thank you for what you do every day, thank you for your service to our Army and nation during a time of war."